Since as early as 1952 when the great London Fog killed 4000 people, nature has tried to warn the man about how harmful air pollution can be. In big cities especially in developing countries, it is commonplace to see thick sheets of dense smog during certain times of the year. While there are external factors that cause a significant part of PM2.5 suspension like winds that blow desert sands all the way from the Middle East towards countries like India during the winter months, it cannot be denied that the smoke emitted by vehicles, the burning of crop, the open bonfires that can be spotted here and there and industrial emissions add manifold to the problem. When human beings are exposed to these pollutants for a prolonged period, they are likely to suffer from serious medical issues that can range from respiratory problems to cardiovascular issues to neurological malfunctions to skin and eye infections. Out of all the air mentioned above pollutants, one of the most damaging element is the pollution caused by particulate matter. 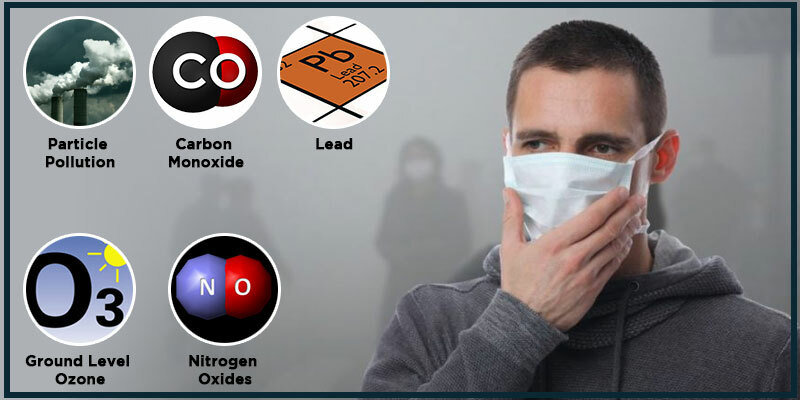 Particulate matter (PM) is very bad for health since it adversely affects the cardio-pulmonary system. Another statistic published by the World Health Organization suggests that PM-related air pollution causes roughly 800,000 deaths per year . Particulate matter is a lethal mixture of minute particles and liquid droplets that consist of dust particles, acids, and other irritants. Particulate Matter can be classified based on the size of the particles. For instance, if the size of the particles is less than 2.5 micrometers, then they are known as PM2.5. This is the most dangerous kind of PM as it tends to embed themselves into the air passages and cause respiratory problems. They are also linked to coronary artery disease since they negatively affect the coagulation process and platelet activation . A study conducted by Zhiguo Zhang and team  and team has gone to prove that curcumin has a positive effect on human bronchial epithelial cells or HBEC that have been exposed to PM2.5 for a long duration. It also states that curcumin has antioxidant and anti-inflammatory properties that are useful in protecting the human air passages from the harmful side effects of inhaling PM2.5 laced air. Another study carried out by Abderrrahim Nemmar and team has proven that curcumin can protect the respiratory and cardiovascular system from the hazardous effects of particulate matter produced by diesel engines by inhibiting the activity of tumor necrosis factor α (TNF α). This is because of the anti-inflammatory nature of curcumin . Turmeric has fantastic expectorant properties. When mixed with other natural phlegm loosening agents like onions or ginger and honey, it can be very effective in decongesting the airways that have been congested due to extended exposure to PM2.5. Curcumin helps in detoxifying the body by boosting the function of the liver and the kidneys. Both the liver and the kidneys are organs that work towards eliminating the toxins from the body. Curcumin has broad spectrum anti-microbial properties that make it very useful when it comes to fighting lung infections arising from inhaling PM2.5 laden air. Many bacteria and viruses can be stopped in their tracks by taking a regular dose of curcumin every day. Bagdara Farms, an Indian agricultural venture, has taken a step towards helping people battle the menace that arises from PM2.5 induced air pollution using curcumin. A stretch of verdant farmland stretching across the Bandhavgarh forests, Bagdara farms has been devoted to the cultivation of high-quality curcumin that is grown using state-of-the-art organic farming techniques. As a result, the curcumin that comes out of Bagdara is top-notch and contains no chemical residues at all. Using this curcumin a supplement known as Pollutamin-PM2.5 is created that can help those fighting with air pollution across the world. Regular consumption of Pollutamin-PM2.5 has a protective effect on the cardiovascular as the respiratory system. 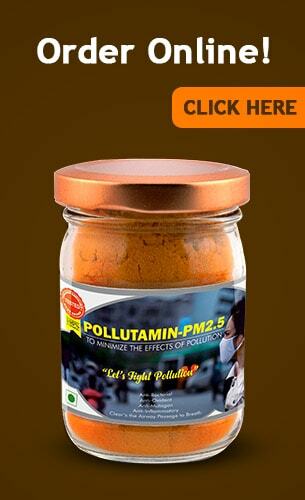 Order your jar of Pollutamin-PM2.5 today and take the right steps towards saving your body from the PM2.5 monster!